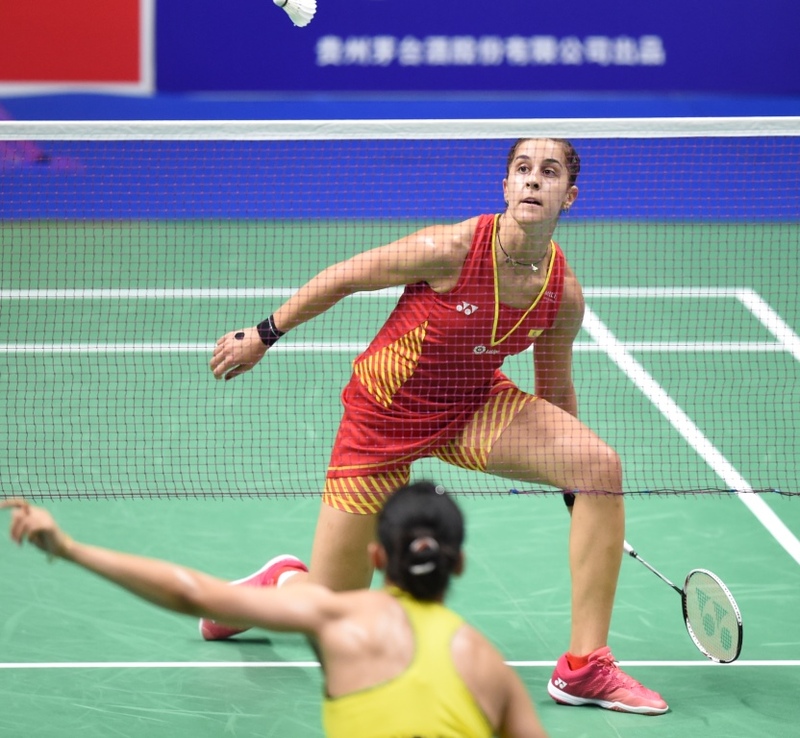 Three top seeds were stunningly shot down as seismic shifts rocked the TOTAL BWF World Championships 2018 quarter-finals this afternoon in Nanjing, China. 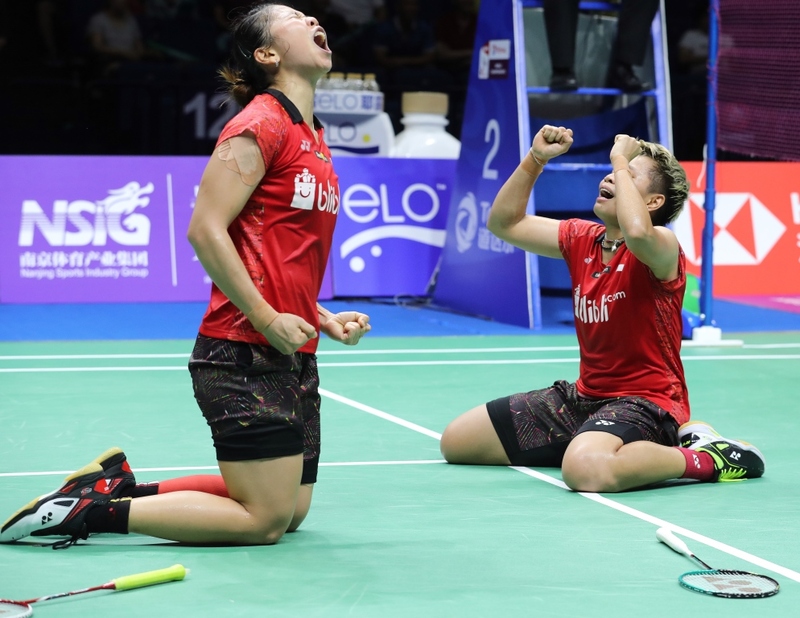 On the day that medallists were determined, first to feel the sting of defeat were reigning Women’s Doubles World title-holders, Chen Qingchen and Jia Yifan, whose miserable season continued as they fell to an inspired performance by Greysia Polii and Apriyani Rahayu (featured image). The Indonesians refused to yield in a cat-and-mouse battle that was as mentally draining as it was physically, showing nerves of steel to save two game points in the first game and three in the second for a heart-stopping 23-21 23-21 victory in 68 minutes. “What a match! Those two games were really tight. Attacking was our strength today. We tried to keep a positive mindset and encourage each other. That was the most important thing besides strategy. They kept changing strategy and we changed also – long rallies then quick attacks. “It was just about whoever survived today. Both sides could win. We are so happy that everything came together,” declared a beaming Polii. The vanquished champions and No.1 seeds rued their loss. 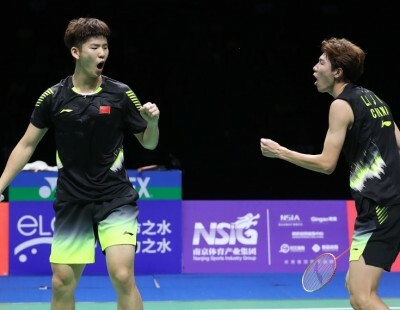 Chen noted they had opportunities to win both games but could not complete the job while their opponents buckled down and grabbed the important points. The weight of expectation played a part in their failure, she added. Meanwhile, Polii and Rahayu will meet Mayu Matsumoto and Wakana Nagahara in the semi-finals. 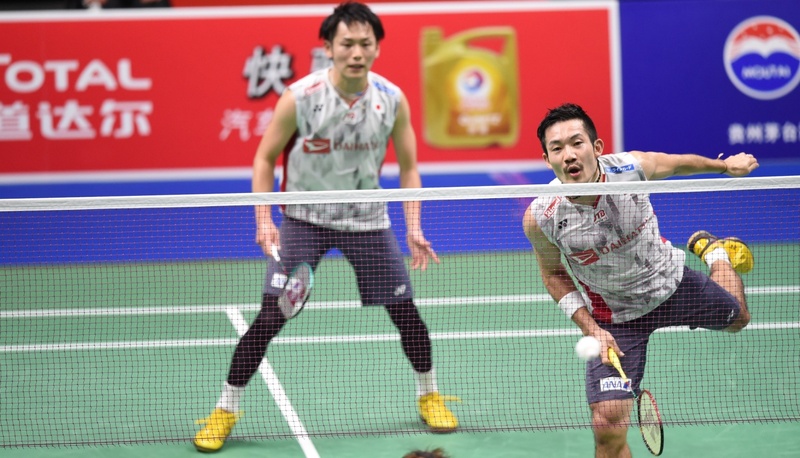 The Japanese emerged victorious in an attritional tussle with Thailand’s Jongkolphan Kititharakul and Rawinda Prajongjai (21-12 22-20). 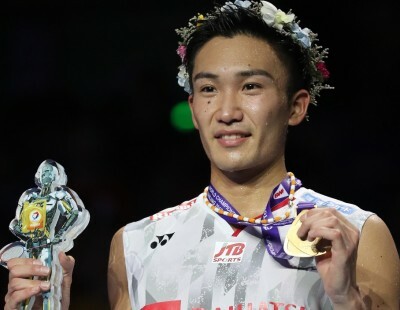 Next came the day’s most astounding result – 21-18 7-21 21-13 – as He Bingjiao delivered the tournament’s biggest breaking news: the demise of Women’s Singles titan Tai Tzu Ying who had been a shoo-in for the title. Having lost a close first game, Tai responded in a deadly fashion that suggested He would not be let back into reckoning. 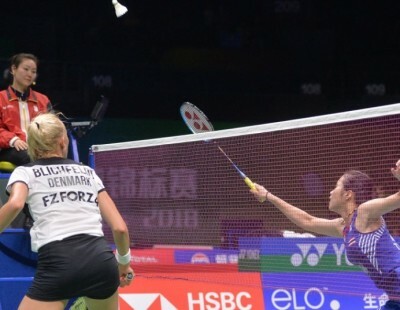 However, buoyed by increasingly loud chants of “Jiayou!” from her countrymen, the 21-year-old left-hander – whose name has hardly surfaced in medal chatter – rode her luck as her Chinese Taipei opponent uncharacteristically unravelled in a tense decider; the stage at which Tai usually motors away from rivals with mesmerising strokes. Instead, it was He who put daylight between herself and the world No.1 who had previously lost just once this season. The result snapped Tai’s 35-match winning streak. “I am surprised. I got a bit lucky. 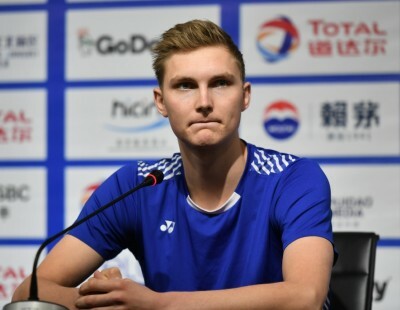 I have lost to Tai a few times so I tried to use those experiences to help me today,” said 21-year-old He, who won the Youth Olympic Games title in Nanjing in 2014. Leading 11-7 at the last changeover, the No.6 seed continued with a steady game, scoring a few winners but also benefiting significantly from inaccuracies in Tai’s shot-making, including the last point as the shuttle sailed over the baseline. “I made a lot of mistakes and I didn’t control my shots very well. I was a bit impatient,” summed up Tai, putting on a brave face amid her disappointment. 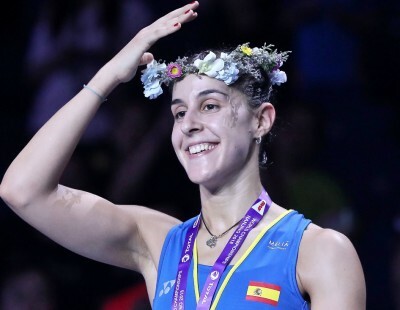 He will now clash with two-time World champion Carolina Marin who continued her impressive resurgence, demolishing India’s Saina Nehwal, 21-6 21-11. Looking back to her ominous best, the lithe Spaniard signalled she means business, spending a mere half-hour on court. 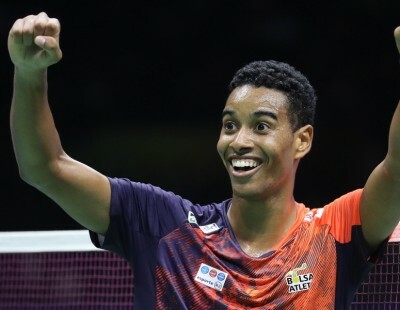 “I am really happy to reach the semi-finals. 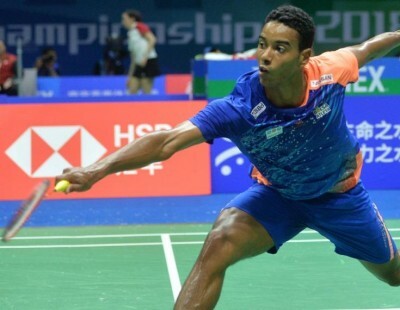 It will be tough but I have been performing well since I got here and I hope to do my best again tomorrow,” said the 2014 and 2015 World champion. Barely had fans absorbed the shock of Tai’s defeat before another unfolded. 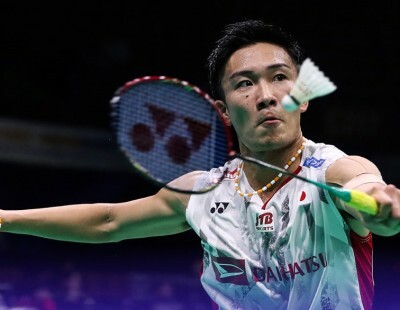 This time it was Indonesia’s Men’s Doubles kings – Marcus Fernaldi Gideon/Kevin Sanjaya Sukamuljo – who perished at the hands of arch-rivals, Takeshi Kamura/Keigo Sonoda. The latter manned the front court while his equally-lively partner provided knockout smashes from deep to rout the top guns, 21-19 21-18. 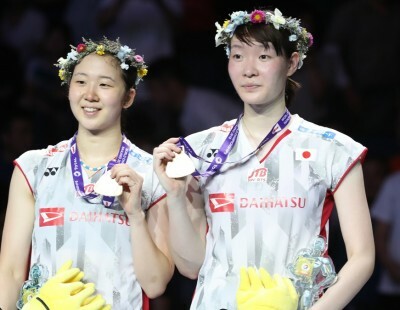 As they have done so many times, world No.1 pair appeared on track for another miraculous comeback when they clawed from 11-18 down to level the scores the second game but the Japanese No.5 seeds reeled off three straight points to earn at least bronze for their country. “The Indonesians are a strong pair but today we played better. We are not happy with just getting to the semi-finals. It’s our goal to win the title,” noted the jubilant duo. 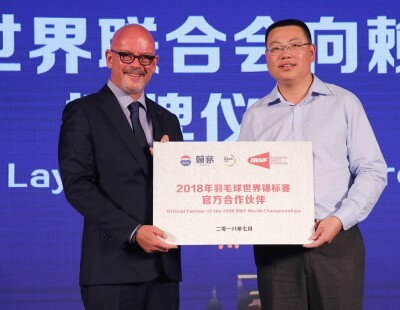 The early session also featured a sensational comeback by Shi Yuqi who refused to give up against the skilful and more experienced Chou Tien Chen. 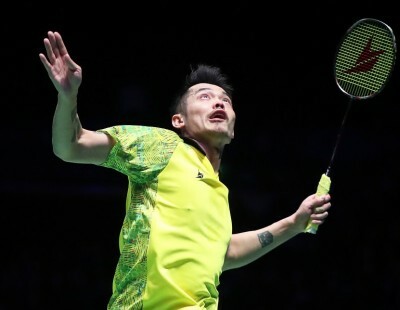 The latter looked like he had a medal in the bag – ahead 15-7 in the decider – but an inexplicable meltdown saw his Chinese rival rush past him in the closing stages, snatching 14 of the last 17 points. 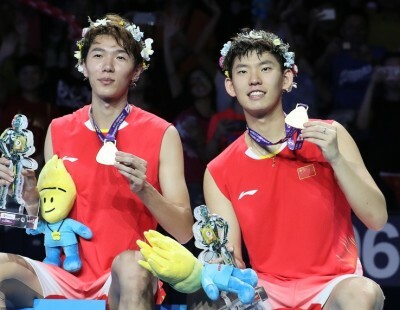 The 16-21 21-15 21-18 outcome left the 28-year-old Chinese Taipei star fighting back tears. “I didn’t expect to win this match. It was really hard work. I attacked a lot but that didn’t work well as Chou defended well. So, I had to be patient while seizing any opportunities,” said Shi in the aftermath of securing his first World Championship medal. 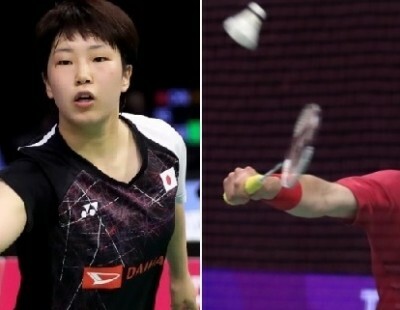 Amid all these happenings, the hosts secured at least silver and two bronze medal in Mixed Doubles with three Chinese pairs advancing to the semi-finals. 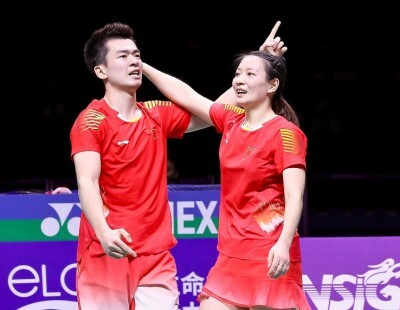 Top seeds Zheng Siwei/Huang Yaqiong will battle their team-mates, Zhang Nan/Li Yinhui, for a place in the final while No.2 seeds, Wang Yilyu/Huang Dongping, tackle Tang Chun Man/Tse Ying Suet. 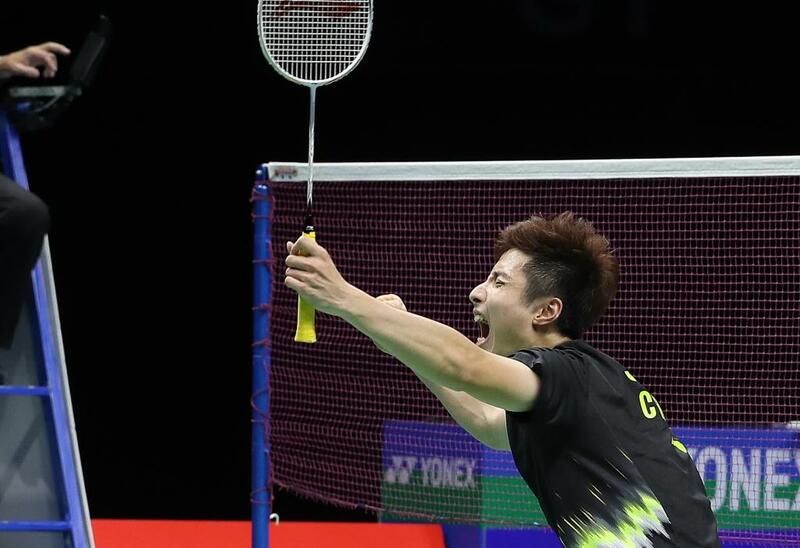 The No.3 seeds thwarted Malaysia’s Chan Peng Soon/Goh Liu Ying (21-12 11-21 21-10) to ensure Hong Kong will be on the podium in this discipline for the second World Championships in succession. “I’m very happy. It’s the first time I’ve gotten so far at the World Championships. 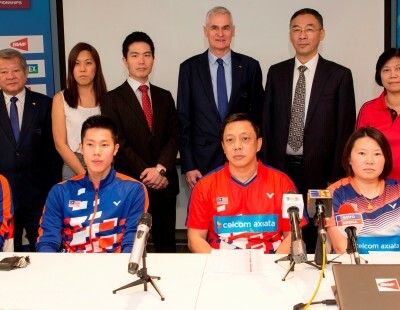 We tried to attack first and stay in the lead in the third game and we are pleased with our performance,” said Tse.